If you’re not familiar with Northern Spain, we’re starting out here in Baiona, Galicia in NW Spain which is near the border with Portugal. To get here you can fly into Santiago de Compostela and Vigo’s airports in Galicia or into Porto in Portugal and drive to Baiona. Not only are the views from the port stunning but we are big fans of the Parador here that looks right out onto the Atlantic. The Parador has seen its share of action offering shelter to the Moors, a few emperors, the Cistercian and Franciscan monks, the Duke of Lancaster and even Drake was here. If the sea beckons, you should seek out the many cliffside walking trails or hire a boat and sail over to the Cies Islands. 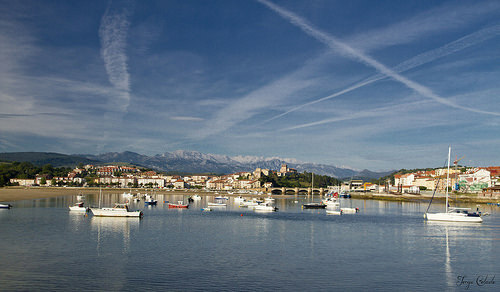 If you prefer terra firma, enjoy Baiona itself and the nearby fishing village of A Guarda for its Celtic settlements. Foodies will be keen to enjoy the seafood (clams, oysters, scallops, shrimp, crab and octopus) and local Albariño wines served at the Parador and the many bars and restaurants by the coves and beaches nearby. Check out our post on a honeymooning couple in Baiona here for more ideas. If you enjoy visiting wineries and want to have some nice seafood to accompany your Albariño from Rias Baixas, this small traditional fishing village is your kind of place. Base yourself at the Parador at Cambados which we highly recommend and you can head over to Combarro during the day. Known for its 30 or more ‘horreos’ which are grain granaries built in stone (although in this case, they were used for storing fish) and its eight elegant tall crosses to protect the fishing communities – you’ll find lots of wonderful places to dine and stroll around. 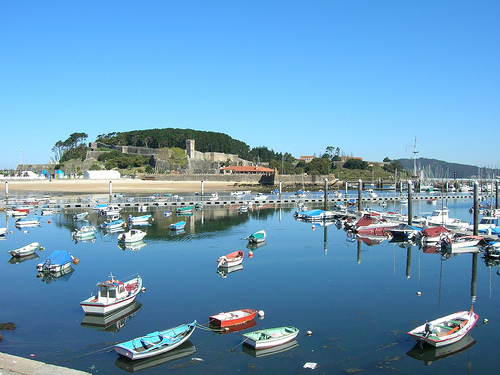 Also close to Cambados and more developed than Combarro, Sanxenxo is referred to as the capital of the Rias Baixas. Again, expect lots of wonderful wines to accompany your meals in the many many restaurants from the amazing local wineries. The port is busy here with the tourist boats mingling with the locals bringing in their catch. The beach here is wonderful and because Sanxenxo is so popular with Spanish holidaymakers who have built holiday homes locally, you’ll find lots of shops and services as well as seafood restaurants and ice-cream outlets. This is also a very popular part of Spain for spa hotels as the seawater in the area, especially La Toja, has been known for centuries for its health enhancing properties. Of course, Galicia is a huge region with lots to see. 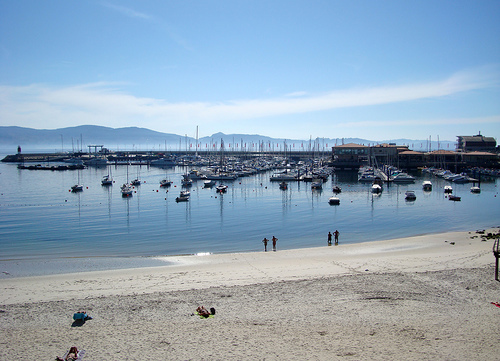 Check out what else we did here in our guide to Galicia’s Rias Baixas and lots more besides. You might also want to see our guide to Porto and the Norte region of Portugal. Asturias is located between the provinces of Galicia and Cantabria and is known in Spain as the ‘Paraiso Natural’ or Natural Paradise. It’s a beautiful region of green valleys, glens, meandering coastline and is part of the stunning Picos de Europa Mountains nature park. 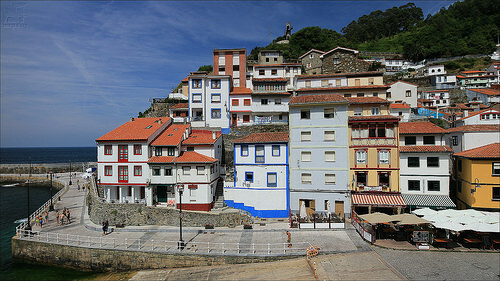 The first fishing village we’d like to recommend in Asturias after we leave Galicia is Cudillero. We love this spectacularly beautiful fishing town – which again must have over a dozen restaurants in the teeny picturesque port. In addition to the fish and overflowing seafood platters known as ‘mariscada’ you need to try the local bean stew called ‘fabada’ and ‘requeson’ – a delicious ricotta-style cheese made from sheep’s milk – for dessert. A walk alongside the coastline towards the lighthouse is obligatory in this gem. Another must-see along this coastline – spend some time at the port, the clock tower and the church of Santa María de Sábada. If you heeded our advice for Cudillero and had the ‘mariscada’, today you should try some local cider and the blue Cabrales cheese made inland. Try it with bread or smeared over a steak or mushrooms – it’s delicious. 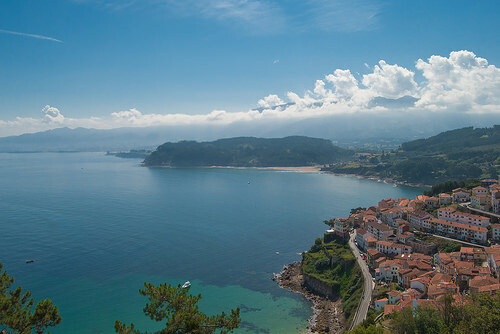 The views of the Picos mountains are particularly lovely from Lastres. The town is quite steep so wear comfortable footwear if you plan to stroll around here! Famous for its annual canoe descent down the River Sella in August when the locality comes to a standstill (check it out here on YouTube) Ribadesella is a lively place that’s perfect for water sports such as kayaking, surfing and of course the swimming is good too. The town has a great selection of restaurants offering traditional Asturian fare. Be sure to try one of the local specialities called a ‘cachopo’ which consists of large veal fillets stuffed with ham and cheese. It is eaten fried and hot after being breaded in eggs and breadcrumbs, and is usually served with potatoes, peppers, or mushrooms. If you want to see the Picos de Europa you can easily head inland from here to the Cangas de Onis Parador which is a good place to rest after all the walking, eating and sightseeing. If you want more open road, drive onto Cantabria. 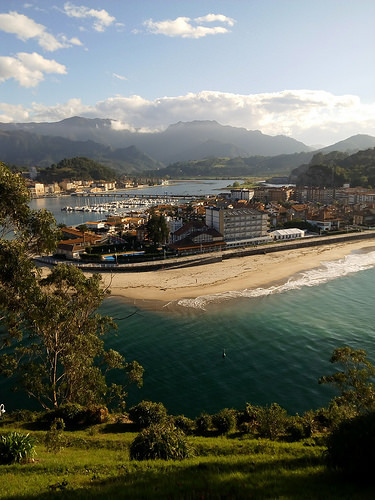 If you’d like to spend longer in Asturias, check out Luanco and Llanes, plus Oviedo and Gijon – and check out our post on the region here. Beloved for its beaches and its fishing port, we adore the impressive views of the Picos de Europa mountain range as you walk on the sand. We are also very partial to its restaurants – from Michelin star Annua down to the more rustic establishments by the port or the castle. Wherever you go, you’ll find ‘rabas’ which is the local calamari – the perfect pairing for an aperitivo with a local wine or vermouth. From here you can go inland to explore the Cantabria side of the Picos de Europa, and overnight at Hotel El Oso in Cosgaya. But if you want to stick to the coastline, proceed to Santander to enjoy its old-world fishing port known as Puertochico – which is excellent for tapas and more formal dining. If you hate anchovies, this might be the place to change all of that. 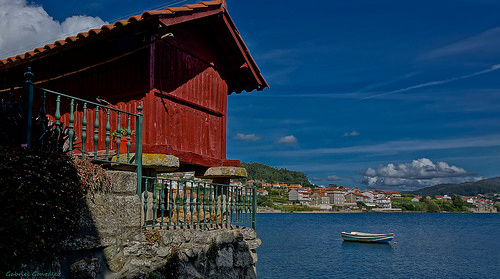 Santoña is a major canning port and you’ll find dozens of warehouses actively involved in the commercialization of Northern tuna and anchovies in olive oil. The downtown area is quite small but you’ll still find lots of restaurants where fish and seafood (including anchovies) are very much on the menu. Wash the seafood down with a crisp local white such as Ribera del Ason and you’re off to a wonderful meal. Military buffs will enjoy the town’s fortifications, grouped around the mountain of Buciero, illustrating the strategic significance of the port and bay. If you’re still feeling fit after that, walk to the lighthouse which is a real gem (especially after you’ve descended the 700 steps to get there). If you hear a lot of Basque being spoken, that’s because Castro is so close to Bilbao and many families have moved here from the city – but it is still 100% Cantabria. The old quarter (with its traditional wooden balconies called miradores) is full of atmosphere and is a great place for a meal of tapas, shared platters called ‘raciones and pintxos. If you are really lucky – you might see some of the local oarsmen – who row the fixed seat boat called a ‘trainera’ – enjoying some of the same. The town has a delightful and extensive promenade for strolling. Want to know more about Cantabria? We live and work from here so we know it like the back of our hand. Check out our Through the Lens post with 25 Images of Cantabria and see our other posts here! 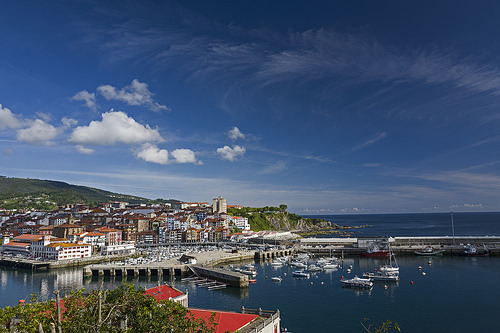 Bermeo is a colourful seafaring village that was once famous for its whaling industry. Today, it’s perfect for some pintxos at the marina known as Portu Zaharra, a stroll through the old town, a visit to the Fishermen Museum or a swim in nearby Mundaka – which is a real surfers haven. Game of Thrones fans will want to check out the impressive San Juan de Gaztelugatxe island – just a few minutes away by car. And Guernica is also nearby. 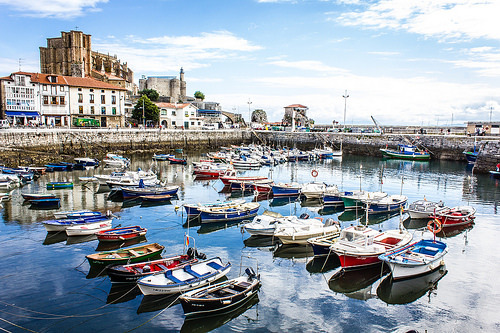 Nestled in between two beautiful beaches, Getaria is a charming fishing village and not only a place for great seafood, but you’ll also find lots of txacoli wineries nearby plus a museum dedicated to the fashion designer Balenciaga who grew up here. If you’re hungry, order some pintxos on Nagusia Kalea or for Michelin -star dining, reserve a table in Elkano. To work up an appetite (or work off that tasting menu), make for the lighthouse on Mount San Anton where the views of the sea are mesmerising. 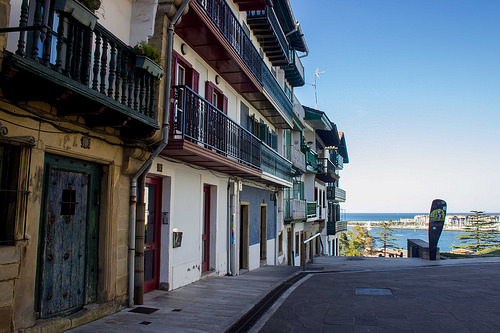 Located right on the border with France, although the only clue you’ll find of this is the number of French tourists enjoying the atmosphere, as Hondarribia makes for a wonderful day trip. It’s stunningly preserved architecture including pedestrianised streets and the old fortified city walls, the number of great eateries – especially in the streets around San Pedro and Santiago, and the beach – make it one of our favourites. If you can, stay at the Parador in town, located in what was formerly Charles V Castle which has a history that’s well worth absorbing too. Getaria and Hondarribia are a 30-minute drive from San Sebastian which is the other must-see in this area. 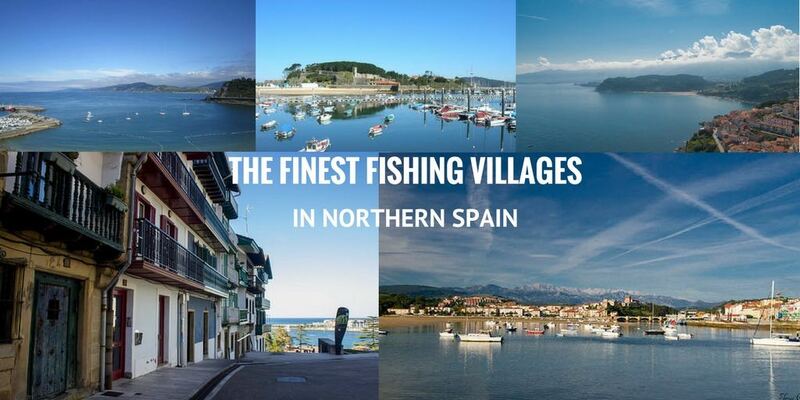 You can base yourself here at night or plan a day trip from either of these Basque fishing port villages to the hot-bed of Michelin-star dining. Read our post on San Sebastian and Bilbao and check out what else you can see in our guide to the Basque Country. And for ideas on what else to see and do in these parts, here’s our detailed guide to Northern Spain. 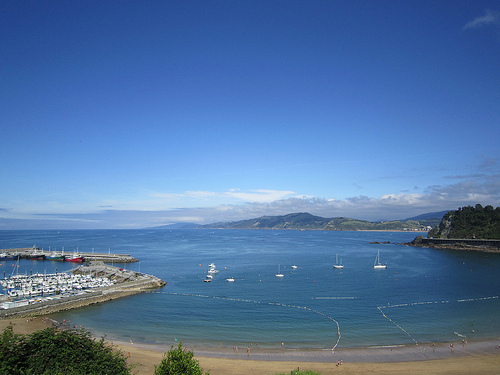 Posted in Asturias, Basque Country, Beaches, Cantabria, Food & Drink, Galicia, Green Spain, Paradores, Popular Posts and tagged Baiona, Bermeo, Castro Urdiales, Combarro, Cudillero, fishing, Getaria, Green Spain, Hondarribia, Lastres, northern spain, port, Ribadesella, San Vicente de la Barquera, Santoña, Sanxenxo, villages.